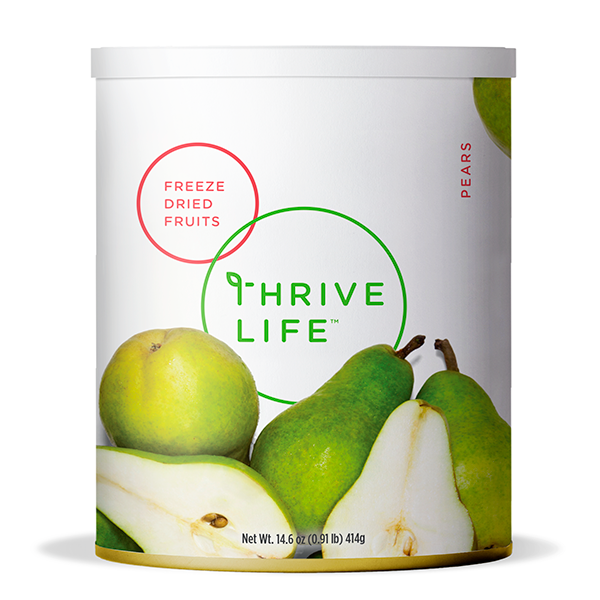 Thrive Pears are freeze-dried into small, bead-size pieces making it simple to receive a quick serving of antioxidants and vitamins. Pears are nutrient-rich in fiber and vitamin C, so they are smart choice for your daily serving of fruit. Thrive Pears rehydrate quickly so they are perfect for using in homemade jams and jelly. You can also toss in a handful of Thrive freeze-dried pears into any fresh green salad to give it a distinctively sweet taste. PEARS, ASCORBIC ACID, AND CITRIC ACID. Add 1/3 cup water to 1 cup Pears and let sit 5-10 minutes until tender. Use these tasty chunks for pear butter, or puree them to make “cheater” applesauce. Mix them with your favorite Yogurt Bites for a sweet treat on the go! They’re great in fruit cocktails too.